I recently went to Korean BBQ with the family and was reminded of how fond I was of these sweet and crunch pickled daikon radishes. I like them so much, I like to hoard the ‘all you can eat’ banchan (little Korean side dishes) they serve, the pickled daikon radishes ones in particular. I mean who goes to Korean BBQ to eat pickles? Me apparently. There’s something so satisfying about snacking on crispy sweet and sour veggies. My fridge is so full with jars of pickles and condiments, I honestly wonder how I ever have room for anything else in there. Pickles are not limited to just snacking though, I find them very versatile. chop them up add them to creamy salads (potato salads, tuna salads etc) to break up the heaviness. 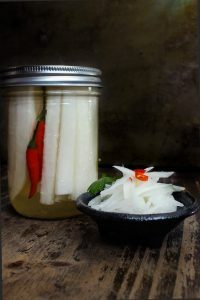 For this pickled daikon recipe, you can buy most of the ingredients in your local grocery store. If you cannot find daikon radishes in your local grocery store, you can find them at an Asian grocery store. 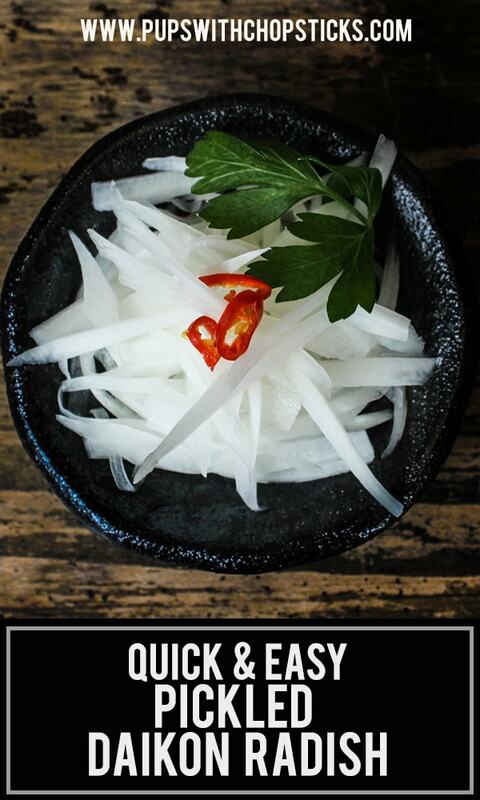 Make sure you pick out very firm daikon radishes when you are shopping for them. The firmer and less bendy it is, the more fresh it is. Optional: Garlic and Red Chillis. If you like garlicky pickles smash a clove and put it in! If you like spicy pickles add a few chillis in! I left them whole but you can slice them up as well for a more even distribution. Tip #1: Add a slice of beet for pink coloured pickles! A little beet goes a long way, a small slice of it will be more than enough. 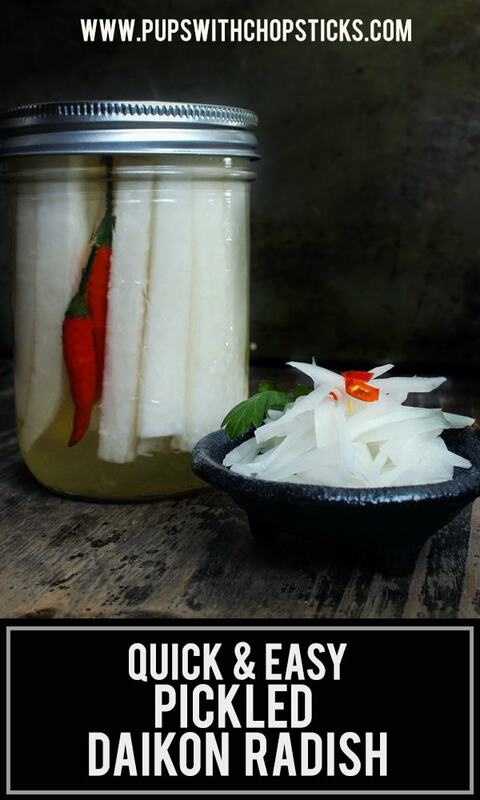 The general rule of thumb is, the thinner you cut your ingredients the faster it will pickle. However, if you plan to keep it overnight anyways then it doesn’t really matter how fast it pickles! 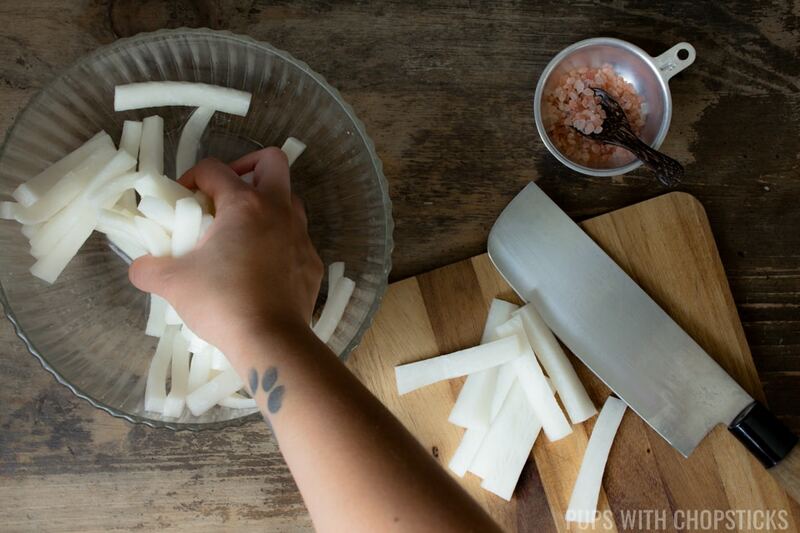 I like to cut my daikon into long rectangular shapes partially because of versatility. You can always go from large to small but you can’t go backwards. With the rectangular shape, I can choose to cut them into thin slivers for sandwiches or cute them up into maybe icubes for salads and if I choose to just eat them straight out of the jar a thicker rectangular cut has a bit more crunch to it. 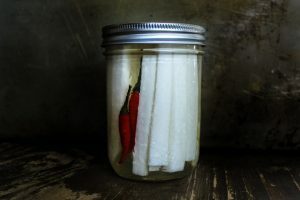 I have noticed that depending on how fresh the daikon is, you might produce bitter daikon pickles. The more soft and bendy (not fresh) daikon you use, the more bitter your pickles will turn out. To work around this, since not everyone can control how fresh their daikons are, I have added a salting step to draw out the bitter water out of the daikon before we start pickling it. This extra step is definitely worth it and will give us perfect pickles every time. 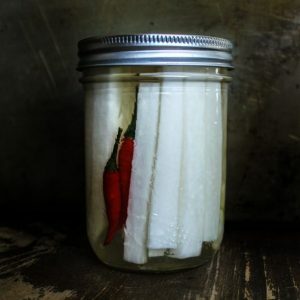 How Long Can You Store These Pickled Daikon Radishes? They can be stored for about 2 months, but they taste best within a month. Time to get our crunch on! 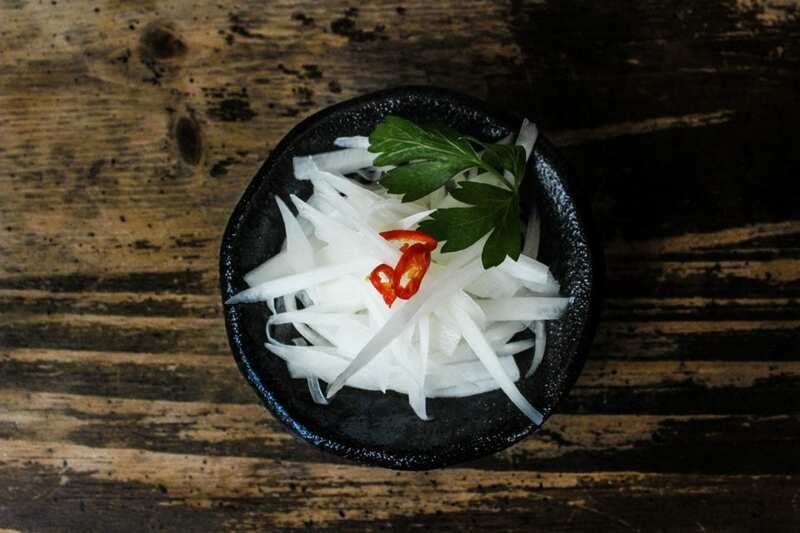 Sweet & tangy pickled daikon radish recipe with a crisp crunch! Quick & easy to make and requires no heat, just a refrigerator! 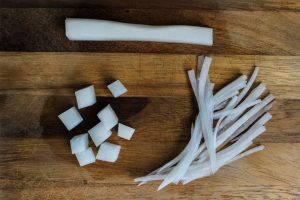 Cut the daikon radish to the shape you prefer. (thin match sticks, thick sticks or cubes). and put it in a large bowl. Add 1 tablespoon of salt and massage it into the freshly cut radish. Let the radish sit for 15 minutes while it draws out the bitter water. 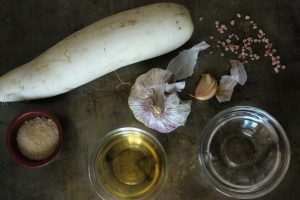 In a separate bowl, mix together all the ingredients under the ‘Vinegar Brine’ and set aside. Taste the vinegar solution to see if it is sweet or tart enough for your preference. 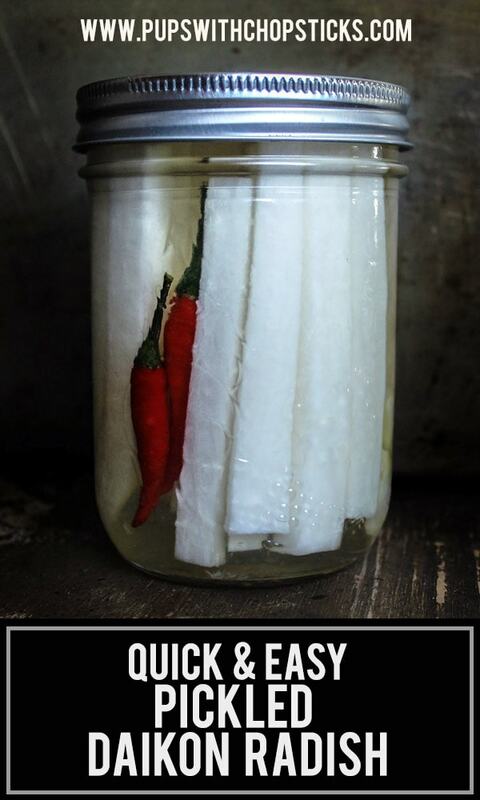 Add the daikon radish into glass jars and cover with vinegar brine until the daikon is fully submerged in it. If you want it garlicky or spicy, add in the optional smashed garlic and whole chili peppers into the jars as well. Seal well and let it sit in the fridge for a minimum of 2 hours but preferably 24 hours. Add a slice of beet for pink coloured pickles! A little beet goes a long way, a small slice of it will be more than enough. You can also add carrots in addition to the daikon radish to this recipe as well. Thanks for sharing! I just made some with my first ever daikon radish. How long do these last in the refrigerator?? 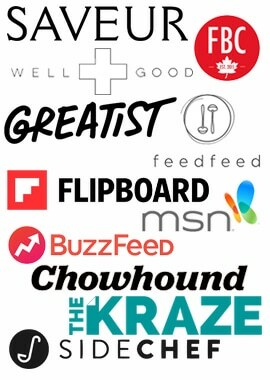 I’m always happy to share! 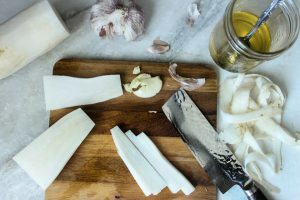 I just love all the little details you delve into for each post/recipe – it’s so helpful and illuminating, and really makes me feel like I can make the recipe with ease! I also love pickles – will have to try them on top of noodle dishes, like you suggested, as I’ve never thought of that before. I also like the idea of adding in some garlic, I bet that’s uber delicious! PS: I tried subscribing via your subscribe box in the sidebar, and it kept saying I had an invalid email 🙁 I’m going to try subscribing through the comment now, but just thought I’d let you know. Thanks for letting me know about the subscribe box. I took a look at it, hopefully it’s back to normal now. Same here! I already finished my batch! Just munching on it while watching tv haha!